4-20: Marilyn Olson Executive Director of VillagesOKC – It is a Plan for the 50-Plus NOT a Place! This week on The Rise & Thrive OSJ Radio Hour, Saturdays 9:05 a.m. on The Eagle, KZLS 1640AM or listen in on the OSJ app and website “Home Page” anytime! In-studio: Marilyn Olson Executive Director of the Non-Profit VillagesOKC – It is a Plan for the 50-Plus NOT a Place! Marilyn Olson is Director for VillagesOKC which is Oklahoma City’s first and only virtual community. It’s a Plan not a place. VillagesOKC, Inc is a non profit cooperative of like-minded mature adults who volunteer and help each other as we age in our own homes. Ms. Olson is an Oklahoma farm-girl holding a degree in Education from Southern Nazarene University. For the past 35 years she’s tackled issues of aging from within several retirement communities, hospitals and nursing homes and as frequent caregiving consultant to families. She has extensive experience as the responsible caregiver for several family members. At separate times she has been caregiver for a 92-year old Aunt in Medford, an 89 year old uncle in Marlow, and for ten years her 103 year old mother. Marilyn and her husband say they are enjoying their best decade yet with three grown daughters, their husbands and 10 above-average grandchildren. We are an Oklahoma not for profit corporation established September 2017 by a group of volunteer neighbors. The vision is for many cooperative Villages across the Oklahoma City metro area. As a hub organization, we share knowledge and resources, still allowing multiple Villages to develop their own neighborhood organizations. We believe by working together we can accomplish more but share what is common thus minimizing costs. The hub nurtures, coaches and supports the work of each village within the spoke. https://okseniorjournal.com/wp-content/uploads/2019/04/marylon.jpg 1133 1466 rg7878 https://okseniorjournal.com/wp-content/uploads/2017/09/OSJ_Logo_300dpi-300x100.jpg rg78782019-04-18 12:19:392019-04-18 16:33:224-20: Marilyn Olson Executive Director of VillagesOKC - It is a Plan for the 50-Plus NOT a Place! 4-13-19: Ginny Curtis & Jennifer Melton of MCM Insurance have your Medicare Knowledge! Ginny Curtis founder and Back bone of MCM Insurance has worked in the insurance industry for 34 years. She is passionate about educating seniors so they feel confident in making decisions about their health coverage. Ginny enjoys playing an active role in the lives of her children and grandchildren. Jennifer Melton, co-director of MCM Insurance licensed for 8 years, holds a masters degree in education. She loves spending time with her clients and guiding them through the process of selecting the plan they deserve. She is a loving wife and mother of two children who enjoys home making and quilting. https://okseniorjournal.com/wp-content/uploads/2019/04/IMG_4412.jpg 1218 2190 rg7878 https://okseniorjournal.com/wp-content/uploads/2017/09/OSJ_Logo_300dpi-300x100.jpg rg78782019-04-10 14:07:532019-04-10 15:41:404-13-19: Ginny Curtis & Jennifer Melton of MCM Insurance have your Medicare Knowledge! This week on The Rise & Thrive OSJ Radio Hour, Saturdays 9:05 a.m. on The Eagle, KZLS 1640AM or listen in on the OSJ app and website “Home Page” anytime! In-studio: Denise & Rick Guttenberger with Senior Care Referral Services of Oklahoma. Denise began her career as a radio personality in New Orleans. After marrying Rick, Denise became a full-time mother of triplets and spent the next 20 years caring for two sons and one daughter. 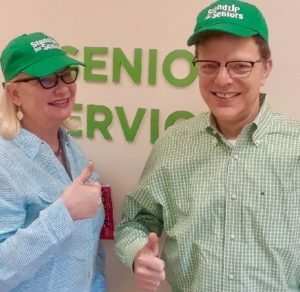 For the last five years, Denise and her husband are the sole owners of Senior Care Referral Services and have helped hundreds of families each year navigate the often confusing options of residential senior care – all at no cost to the families they serve! Rick was a hotel General Manager for 25+ years with Hilton Hotels until he and his wife started Senior Care Referral Services. Rick & Denise realized that having a local trusted group that could walk with families through this process would be valuable here in Oklahoma City. Senior Care Referral Services is now the longest running and largest local placement company in the State – and they offer all their services at NO COST to the families they serve. This week on The Rise & Thrive OSJ Radio Hour – Saturdays 9:05 a.m. on The Eagle, KZLS 1640AM or listen in on the OSJ app and website “Home Page” anytime! Larry Reed, the Man On Weed, is an on air personality that joined Cannabis Network Media in 2014. Since then he has covered the cannabis world and has reached over 5 million people, focusing on the medicinal properties of the plant along with the industrial and recreational aspects. Larry Reed’s focus is to do live broadcasting from industry events and bring the experience to a world wide audience to those events! Carri Lawrence the owner of “Chronic Brands” in Oklahoma has been in the professional staffing and employment arena for over 20 years. The goal of the “Chronic Brands” is to be the one stop shop for anyone needing assistance in the cannabis industry from one of Oklahoma’s first virtual doctor recommendation scheduling services, “Chronic Docs” pairs the individual with a real Doctors to aid in you obtaining your legal Medical Cannabis Card discreetly & privately. 1-866-405-WEED, www.chronicpalooza405.com, Facebook is Chronic Palooza, Oklahoma State Fair Park of Oklahoma City in the Hobby Arts and Crafts Building & the Modern Living Building. WHAT’S In The Box … LOOK It’s The 17th Annual “Informed Senior Seminar,” Friday – April 12th 8:30am to 12:30pm @ 900 N. Portland Ave.
Sheryl Presley in studio with OKCPD TRIAD – Senior Safety & Plans Against Scams! This week on The Rise & Thrive OSJ Radio 📻 Hour Saturdays 9:05 a.m. on The Eagle, KZLS 1640AM or listen in on the OSJ app and website “Home Page” anytime! Susan Ellis serves as Area Commander for The Salvation Army of Central Oklahoma. Susan oversees programs and services throughout the service area of Canadian, Cleveland and Oklahoma counties. She grew up in Augusta, Georgia and attended the University of Georgia, receiving a Bachelor of Arts degree in journalism. She enjoys knitting and crocheting, cooking, and cycling with her husband. Jill Walker plays a very active role at The Salvation Army of Central Oklahoma through her volunteerism. She currently serves on The Salvation Army Advisory Board and is treasurer for The Salvation Army of Central Oklahoma’s Women’s Auxiliary. She is co-owner of Maccini Construction Company, a general contracting and construction management firm in business since 1982, providing commercial and residential construction services. Eric Lindsey, Villagio Communities Owner & CEO – With 21 years of operations in 12 states and experience in every facet of Senior Living, Eric Lindsey leads Villagio Senior Living as CEO, proving that showing respect toward our older generations stands the test of time. It has been his honor to work alongside thousands of associates and tens of thousands of residents and family members in providing the highest level of Senior Living options then, now, and in the future. Rhonda Hickman, Marketing Director – Rhonda has been in the Medical Field since 1975 as a Certified Respiratory Therapist, she also achieved her Certification in Pulmonary Function Technology. Rhonda has worked in hospitals, Skilled Units, Ventilator Long Term Care Unit, Home Medical Equipment Company servicing Respiratory patients, Home Health, Hospice and now Senior Living. She understands the challenges of being in the “Sandwich Generation” with elder parents and a teenager. Caitlin Cairns, Vice President of Resident Programing – Caitlin Cairns has worked in senior living as an activity director for seven years; she is currently the VP of Resident Programming for Villagio Senior Living. Caitlin has a background in counseling and the therapeutic arts and is the only Registered Drama Therapist (RDT) in the state of Oklahoma. Caitlin is delighted to help bring creative arts experiences to seniors. Angie Doss is the Chief External Relations Officer at Sunbeam Family Services. She joined Sunbeam in September 2018. Doss graduated from San Diego State University with a bachelor’s degree in public relations. Doss is a Big Sister through Big Brothers Big Sisters and is a LOYAL (Linking OKC’s Young Adult Leaders) Class XIII graduate. Through March 31, join Sunbeam in raising $65,000 to support the Emergency Senior Shelter. Learn more at sunbeamfamilyservices.org/dignity or call 405-609-8994. Sunbeam was established in 1907-the longest existing nonprofit in Oklahoma. Jill Huff is the Director of Marketing at Spanish Cove Retirement Village. She has over 13 years’ experience at Spanish Cove Retirement Village and over 20 years’ experience in senior living in Oklahoma. She is dedicated to helping seniors and their families find the perfect retirement living plan. She has a her Masters in Health Administration from the University of Oklahoma College of Public Health where she focused on senior living. Debbie Miller, CPT, (Certified Personal Trainer) has worked at Spanish Cove Retirement Village as the Director of Wellness and Resident Relations for the past 28 years. Debbie is a certified personal trainer, fitness specialist for older adults, master Tai Chi for Better Balance instructor and has been yoga trained. Debbie helped pioneer the first senior dragon boat paddling team in Oklahoma, that is still active to this day. Johnny Cash LIVE in the OSJ Radio Studio & He Looks Great Too for 86 Years … 🎶 “I Fell in to a Burning Ring of Fire and I Went Down-Down-Down 🎶 To ~ The Rise & Thrive OSJ Radio 📻 Hour!! !” That’s Right Philip Bauer as Johnny Cash … 1# Johnny Cash Tribute Artist in the World! YES, He Sings on the Show too… You will think you are listening to Johnny Cash… It is Remarkable!!!! Philip Bauer considers it a blessing to be able to bring the music of Johnny Cash to all his audiences. His show has taken him all across U.S., Canada, Mexico, New Zealand, and Australia. Since 2008, his uncanny award-winning tribute to the “Man in Black” has given him national television exposure on The AXS Television Network, when he performed a LIVE concert from Hollywood, California’s Famous Whiskey A Go-Go! Read more below about the Upcoming Concert!!! FREE Birthday Cake for Everyone! There will be CDs, T-shirt’s and other merchandise available after the show!